We mourn the loss of Edward Said, who passed away on the morning of Thursday, September 25, 2003. Edward W. Said, the late University Professor of English and Comparative Literature at Columbia University, was for many years the magazine’s classical music critic as well as a contributing writer. Known both for his groundbreaking research in the field of comparative literature and his incisive political commentary, Said was one of the most prominent intellectuals in the United States. His writing regularly appeared in the Guardian of London, Le Monde Diplomatique and the Arab-language daily al-Hayat, printed in every Arab capital in the world. In 1948, Said and his family were dispossessed from Palestine and settled in Cairo. He came to the United States to attend college and lived in New York for many years. Because of his advocacy for Palestinian self-determination and his membership in the Palestine National Council, Said was not allowed to visit Palestine until several years ago. Educated at Princeton and Harvard, Said lectured at more than 150 universities and colleges in the United States, Canada and Europe. His writing, translated into fourteen languages, includes ten books, among them Orientalism (Pantheon, 1978), a runner-up in criticism for the National Book Critics Circle Award; The World, the Text and the Critic (Harvard, 1983); Blaming the Victims (Verso, 1988); Culture and Imperialism (Knopf, 1993); Peace and Its Discontents: Essays on Palestine in the Middle East Peace Process (Vintage, 1995); End of the Peace Process: Oslo and After (Pantheon, 2000); and, most recently, Power, Politics, and Culture (Pantheon). With the "war on terror" now official nomenclature, the problematic conflating of ethnic, religious and "terrorist" identities is now a matter of policy as well as media distortion. In a 1986 book review, Edward Said argues presciently against the dangerous "terrorism craze"--"dangerous because it consolidates the immense, unrestrained pseudopatriotic narcissism we are nourishing." 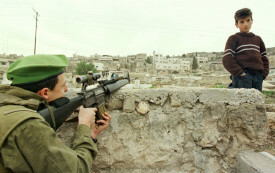 Seeking to eliminate the Palestinians as a people, it is destroying their civil life. Judith Miller is a New York Times reporter much in evidence on talk shows and seminars on the Middle East.